The few days I spent in New York last week were filled with new memories, incredible opportunities, and endless inspiration. Who would've ever guessed that a "work trip" could be so fun! To start off, I thought I'd share what I wore on Day 2 of Live Smart NYC. I wanted to wear something professional, yet fun and comfortable. This was one of those outfits that looked way fancier than it felt. A soft tee and breezy skirt was especially nice since it was so humid. After the conference, a few of us bloggers decided to stroll through Central Park, take a few pictures, and (of course) stop for ice cream. Honestly, my Smart Girls Group friends are just my kind of people. Though we may be spread throughout the country, this is the one time of year when many of us are able to come together to share our passions, have so much fun, and shamelessly Instagram it all! I'm already missing these girls so much and am counting down the days until next year. Be sure to check out what Caroline, Frannie, and Renee wore on Day 2 of Live Smart NYC! Ahh, so cute! 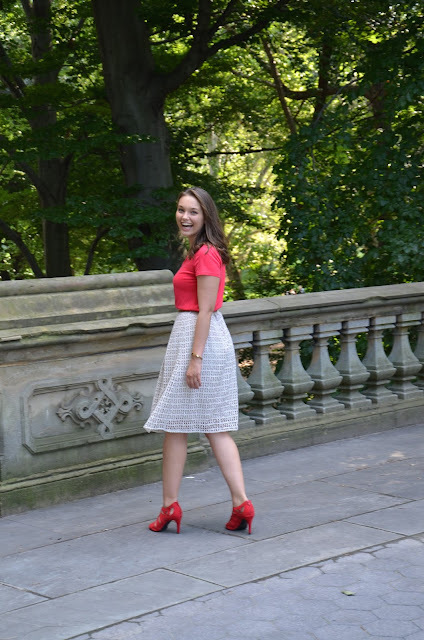 Love your skirt and those shoes, Hannah! So glad you girls had so much fun at the conference! I'm obsessed with your shoes, such a fun color! Love the outfit but man those shoes!!! So cute!! !